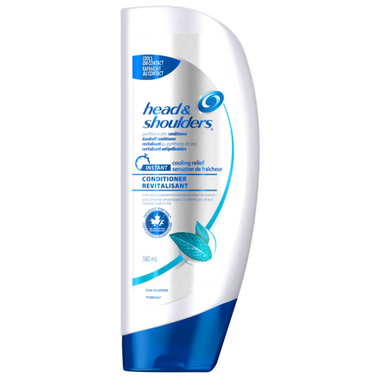 With New Head & Shoulders Instant Relief Dandruff Conditioner with Tea Tree Essence and Peppermint Oil, you’ll instantly feel the cooling sensation. It’s formulated to help soothe the scalp to give you a relaxing yet revitalizing sense of relief and contains peppermint complex and tea tree essence. When used with Instant Relief Shampoo, the conditioner locks in dandruff-fighting power and leaves you with soft, manageable hair. For even more Instant Relief, use with Instant Relief Shampoo and Instant Relief Scalp Soother. Directions: For best results use at least twice a week or as directed by a doctor. Apply to wet hair after shampooing by gently massaging into hair and scalp, rinse well. Ingredients: Water, Stearyl Alcohol, Cetyl Alcohol, Stearamidopropyl Dimethylamine, Fragrance, Dimethicone, Glutamic Acid, Phenoxyethanol, Benzyl Alcohol, Citric Acid, Sodium Chloride, Mentha Piperita (Peppermint) Oil, Menthol, Mentha Arvensis Leaf Oil, Methylchloroisothiazolinone, Methylisothiazolinone, Yellow 5, Blue 1.